Meeting the two artists in person, the appeal of their art is soon apparent. The artworks of Dalma Shōten are distinctive for their magnificent vibrancy and color, and have an arresting presence that immediately draws the viewer in. 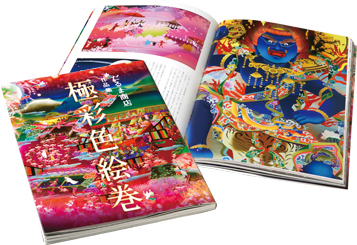 The paintings are tremendously colorful, utilizing gokusaishiki, or the ‘colors of paradise’. Dalma Shōten designs are all created using the most advanced digital techniques, and many scenes or themes in their work represent the history of Kyoto. 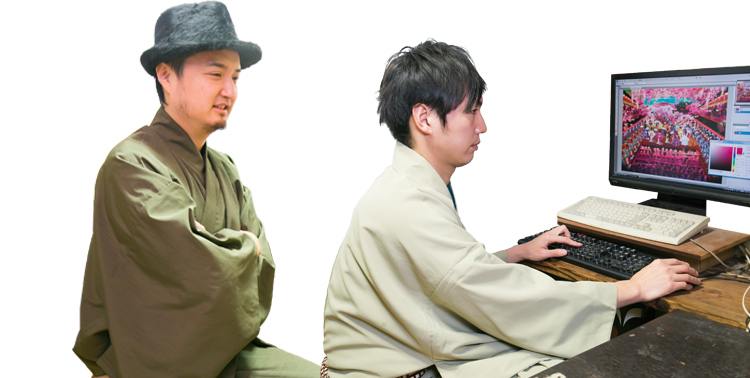 The two have been working together since 2003, with Anzai in charge of computer graphics, and Shima as the creative director. They met in Tokyo through a shared interest in traditional Japanese aesthetics. 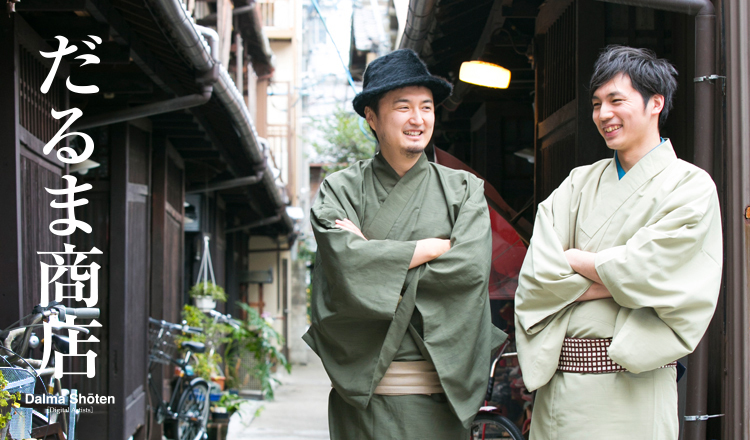 After six months of collaboration, the pair moved to Kyoto and settled in a kyo-machiya (traditional wooden townhouse) located by an old alley called Ajiki-roji, which is where they continue to work today. Anzai, who has had a lifelong passion for drawing, is completely self-taught. He thinks it possible that his current technique developed because of, and not in spite of, his lack of formal training. Although it’s true that most painters and illustrators prefer to work alone, artistic roles are clearly defined between the Dalma Shōten pair. Anzai explains: "I specialize in the drawing side, while Shima is the brains of the outfit." Shima, however, sees their partnership this way. "Anzai is someone who can use his hands to express what I picture in my mind – not just the look of things, but even the atmosphere." Even their daily lives are a part of the creative process; by living in a traditional old house, they are experiencing the lifestyle of the Kyoto of the past. For example, by drinking sake out of traditional sake cups, they have learned to better appreciate and savor the drink. Shima and Anzai consciously cherish these moments and discoveries, and incorporate them into the details of their works. Their hope is that their Japanese audience would appreciate not only their paintings, but the culture of Japan itself as well, and their passion is to present the finer qualities of Japanese culture is evident. "The quietness and simplicity of the wabi-sabi mindset is often featured as a ‘good old days’ view of Japanese culture, but in reality, Japan is a very colorful country. Throughout history, many things were glamorous and flamboyant," says Shima, whose points to the brilliance of colors in such things as dyed kimono, robes on Buddhist priests, ornaments for festivals, and dishware for vegetarian cuisine. Anzai elaborates: "Because electricity and neon lights catch our attention these days, old things tend to look distant and muted. But back throughout history, there must have been roads where there was only dirt, and buildings were made out of wood. If there were any colors used in this environment, then the world must have looked as colorful as paradise. Today, however, many things tend to look somewhat washed out...". This is why it’s of paramount importance for the Dalma Shōten duo to capture the authentic atmosphere of the historical scenes they depict in their work. And through their artistic filters, we realize that Japan is, in fact, an extremely vibrant place. With such a well-defined technique and a clear philosophy behind the work, one gets the distinct feeling that Dalma Shōten have evolved their own dazzling culture of beauty. In December 2013, on the tenth anniversary of their establishment, Dalma Shōten released their first book of collected works. With an oeuvre of around 800 works over the course of their career, the book became a representative collection of carefully selected pieces. Dalma Shōten are active in many fields. In 2007, Dalma Shōten’s Gokusaishiki Kumano Kodo Sankei Mandara was awarded first prize in an art competition commemorating the registration of the Kumano Pilgrimage Route as a UNESCO World Heritage site. 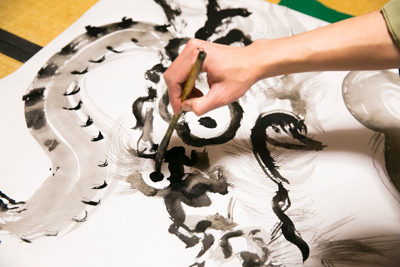 The two have also been commissioned to design murals and decorative walls for Shinto shrines and Buddhist temples. Internationally, they have participated in Japanese culture festivals and have had a solo exhibit in Paris. When asked about goals for the future, Shima replies without thinking that he dreams of designing a Hermès scarf, which is for him the world’s finest handcraft. Anzai, however, has more local aspirations. “I dream of drawing the Emperor of Japan. Emperors have continued to hold the same ceremonies and events since early times, and one cannot talk about Japanese history without the Emperor. To me, it seems as though all the history and culture of Japan are encapsulated in the existence of the Emperor." Whatever they choose to depict, you can be sure that the Dalma Shōten two are artists to watch. Born in 1976 in Kobe. After a career in online marketing and advertising, he met Anzai, and established Dalma Shōten. He is a fan of history, television, comedy, and professional wrestling. Born in 1981 in Saitama, Anzai has been a keen artist since childhood. With an interest in traditional Japanese hairstyles and costumes, he majored in Japanese literature in college. He enjoys drawing, films, kimonos, and Japanese hairstyles. Among the many works by Dalma Shōten, Gokusaishiki Embu Sairei-ezu (Dance Festival in Brilliant Colors) is a piece that got an especially strong response from the viewing public. It depicts a traditional spring dance event called Miyako-odori, performed at the Kōbu Kaburenjyō theatre in Gion every April. The tradition started in 1872, when geiko (the Kyoto name for geisha, or traditional Japanese female entertainers) and maiko (apprentice geisha) performed their dance as entertainment at the Kyoto Exhibition. These breathtaking dance performances can be seen every spring in Kyoto’s gokagai geisha districts of Gion Kōbu, Miyagawa-chō, Kami-shichiken, Ponto-chō, and in the autumn in the Gion-higashi district. For many Kyotoites, the Miyako-odori dance symbolizes the arrival of spring, and the two artists of Dalma Shōten are no exception. “There is a moment right before the finale, when the lights go out and then come back on, immediately followed by the maiko and geiko all resuming their dance, that makes you feel as though spring has arrived,” says Anzai. Dalma Shōten’s depiction of this scene is dazzling. 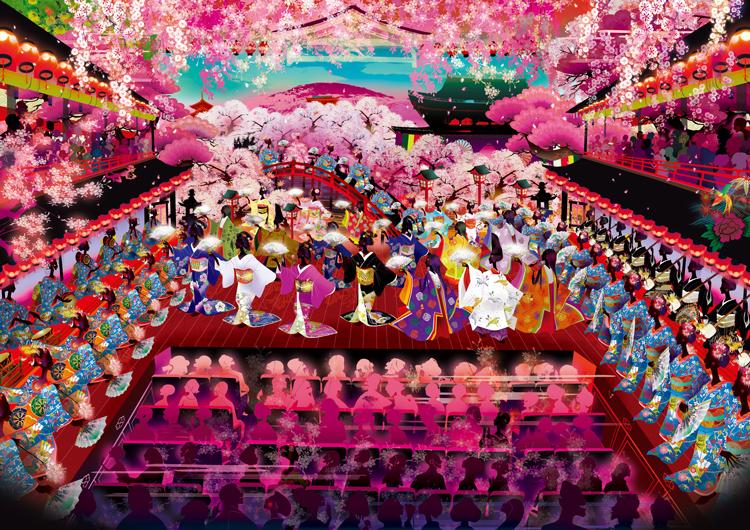 On stage, cherry blossoms in full bloom color the entire arena a brilliant pink, perfectly evoking the Japanese spring. “If we were to express the beauty and allure of maiko and geiko performing their dance- their presence, their scent- in a color, it would probably be this one,” says Anzai. Shima elaborates. 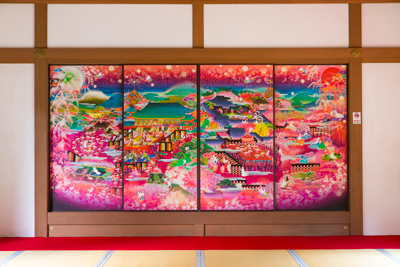 “Rather than painting the Miyako-odori itself, we wanted to illustrate what it’s attempting to express.” Perhaps, this is what they mean by the “sense of atmosphere” that they wish to accomplish in their works. One of the reasons behind the pair’s relocation from Tokyo to Kyoto is their insistence on capturing the notion of “atmosphere.” In Kyoto, there are quite a number of historic buildings remaining, and an atmosphere of the past can also be found in other forms. There is a wealth of stories or meanings behind all manner of things in this city, from the shapes and patterns of kimono to traditional Japanese hairstyles. These meanings may have some special religious or superstitious basis, or they may be more aesthetic, concerned simply with form and physical appearance. “It takes more than reading a book to acquire knowledge, and here in Kyoto, there are many locals who can teach so much. And of course, not all knowledge and culture is written down. 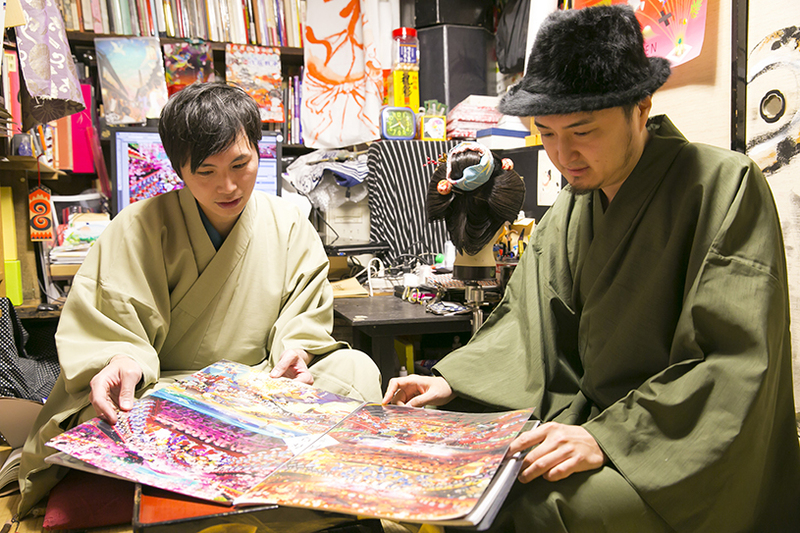 We want to visually express the things we observe in Kyoto,” says Shima. Perhaps it’s possible to say that the city itself is the greatest inspiration for the two artists to further build on their stunning repertoire. 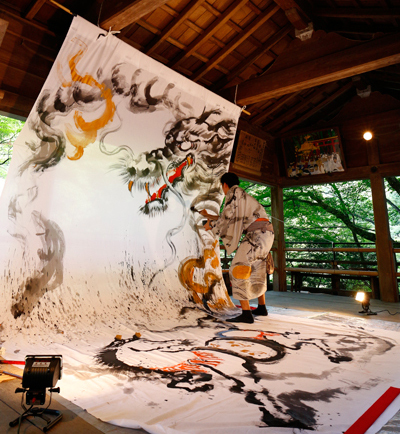 This improvisational piece is the product of a thirty-minute live painting performance at Kifune Shrine. The painting portrays Tamayori-hime (a goddess of Japanese mythology) searching for water, which is symbolized by a dragon. A fusuma-e (painting on sliding door panels) painted for Shunkō-in, a subtemple of Myōshin-ji of the Rinzai sect. It depicts a scene from the 16th and 17th centuries, during which time European merchants became more common in Japan. People are shown enjoying kasutera sponge cake and kompeitō (small sugar candies) for the first time. Both of these Japanese sweets have their origins in foods brought from Portugal. 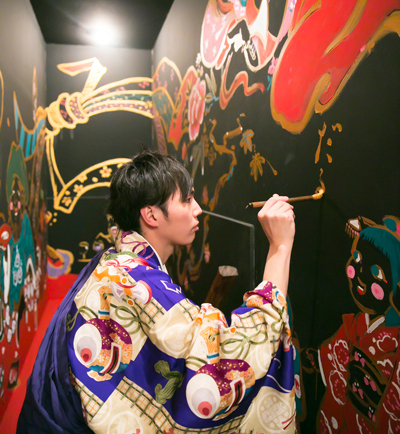 When renovating his bar last year, the owner, Tetsuro Kanai, asked his friends at Dalma Shoten to paint a mural on one of the walls. The challenge was trying to bring to life the request to paint "something celebratory." Since Kanai loves the happy faces of people enjoying their drinks, they decided to use the smiling face of Ebisu (the Japanese god of luck), as well as the rest of Shichi Fukujin (the Seven Lucky Gods) as the main motif. Kanai himself is also hidden somewhere inside the mural. 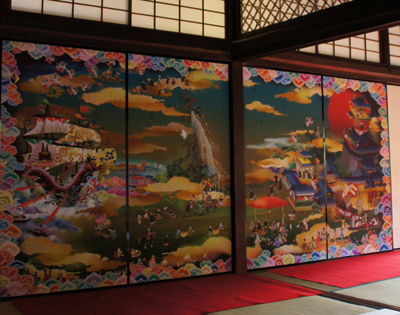 This fusuma-e (painting on sliding door panels) was painted as an gift to Zuishin-in, a Jōdo Shinshū (Shin Buddhism) temple located in the town of Ono, south-east of Kyoto. The temple is considered to be where the gifted poetess Ono-no-Komachi spent her later years. Known for her beauty as much as her poetry, Komachi was one of the foremost writers of the Heian period (794-1185). The plum blossoms, painted in a color known as hanezu (a light vermillion), symbolize her lifetime of romance and passionate affairs. This vibrant painting brilliantly captures the glamour of Komachi and the opulent Heian lifestyle.